Viewers in Sydney and Brisbane will see the Two and a Half Men episode that has a crossover with CSI. The episode is scripted by the writers of CSI (they have a sense of humour?) following the sitcom writers penning an episode of the crime drama. But viewers in other states will be getting the EJ Whitten Legends Game. 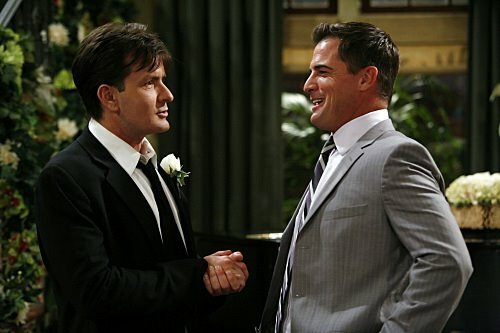 Nine will screen two new, back to back episodes of the Charlie Sheen sitcom at 8:30pm Tuesday July 1: “Look at me Mommy, I’m Pretty” and “Fish in a Drawer.” The second episode is the crossover ep in question, and features an appearance by George Eads. Robert Wagner guest stars in both. The episode also features a specially reworked opening incorporating CSI’s theme song, “Who Are You”. The CSI ep penned by the writers of Two and a Half Men screens two days earlier, Sunday June 29. No word on the sitcom screening in other states yet. Alan helps to plan his mother’s wedding and Charlie makes some moves on the woman who will soon be his stepsister. Also the CSI team are called to the house to investigate a mysterious death. Stars Charlie Sheen, Angus T. Jones, Holland Taylor and Robert Wagner. I downloaded this episode, and all the remaning eps of this series. Channel 9 actually caught up to the US for a few weeks. I’m with toriwannabe on that, i don’t care about a stupid footy game. I’d rather watch a single episode of 2.5 men for 24hours straight than 1 game. I suppose the rest of australia will have to download it cause channel 9 has their head up their arse again. God knows if they will ever air it in other states. Woohoo! Huge fan of both shows and can’t wait to see the cross over eps. This is second CSI cross over in a matter of months as they did the one with Without A Trace a little while back. And as for the CSI writers having a sense of humour if your a regular viewer/fanatic like myself you’ll know that they do. Each season they’ll throw in a few quirky comedic episodes that are usually very well done and quite funny. It helps to have a break from the usual serious tone of the show. Without A Trace does the same thing. Wow, great. I guess that means Melbourne gets stuck with footy again. Why can’t Channel 9 utilise its HD channel for sport so the rest of us who don’t follow footy (yes, there are still a few of us left!) can continue to watch regular TV shows. Great show. Cant get enough of it!! !